Located in Vermont’s Northeast Kingdom on the shores of scenic Lake Willoughby, the WilloughVale Inn & Cottages is the perfect vacation spot for year-round recreation and fun. 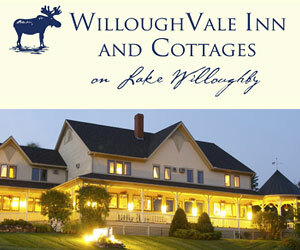 The Willoughvale Inn offers a relaxing escape to the beautiful Vermont mountains. Pack up the family and head to the Northeast Kingdom for a vacation that is all about reconnecting. Stay in one of our year-round cabins. Families come from around the world to experience the Northeast Kingdom’s Natural Playground. Recreational activities abound including hiking, biking, swimming in Lake Willoughby, fishing, canoeing, kayaking, scuba diving, golfing, horseback riding, and the new Pump House Water Park. Kids will love the indoor activities at the Inn complete with a recreation room, DVD rentals and board games. Come up to the Kingdom and enjoy some quality vacation time! Kids under 12 stay free. The lakeside Gil’s Bar & Grill offers spirited conversation, chef’s specialties and sweeping views of the Lake Willoughby and nearby mountains. A highly recommended historic Vermont Inn. Ask us about Jay Peak, Northeast Kingdom VT Vacations. If you would like to add your Northern Vermont Country Inn, Lodge or Bed Breakfast Inn to this web site, please contact us.